As regular readers of this blog will know, my early involvement with calligraphy was a lonely affair. Back in the eighties, there were no classes and no local calligraphy-related societies or groups that I could belong to. England did have a thriving calligraphy-based community, but somehow everything calligraphic stopped at Carlisle, never quite making it over the border into Scotland. The biggest problem for me was having no-one nearby with whom I could share my passion for calligraphy. I joined The Society for Italic Handwriting, and became a lay member of The Society of Scribes and Illuminators, just to make me feel like I belonged to a larger community of calligraphers. But all I could look forward to were monthly newsletters and notifications of major calligraphy events and exhibitions that were happening in London and other big cities south of the border. Scotland was simply not on the calligraphic map. Things began to change in the late eighties, and I like to think I did my wee bit for the cause by teaching one of the first calligraphy classes in Glasgow City Centre (something I’ve continued to do). 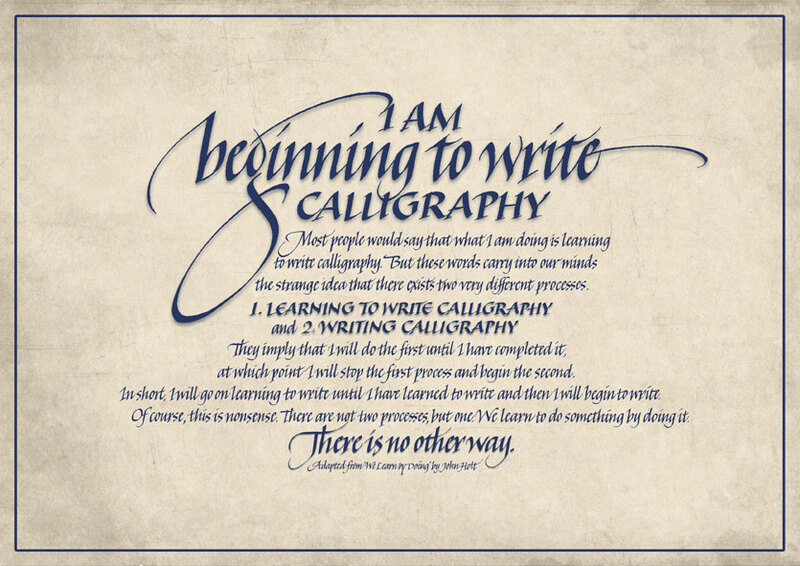 A number of years ago, I learned just how much things had changed when I discovered Glasgow Scribes, a group of passionate calligraphers who meet regularly in the centre of Glasgow to discuss all aspects of calligraphy, and who motivate and inspire each other in the process. I’ve even had the pleasure of having a few members of the group attend my evening classes. I have had a sneak preview of the group’s 2013-2014 Programme of Events, and I’m impressed by the standard of the events, particularly the upcoming workshops by eminent calligraphers, Manny Ling and Janet Mehigan. And during September, Calligraphity, the Calligraphy Bookshop, will be in attendance with a large amount of calligraphy books for sale. Any enthusiastic calligrapher in the Glasgow area who would like to meet up with like-minded folk should get in touch with Glasgow Scribes. Having met many of the members, and having viewed examples of their calligraphy at their annual exhibition, I can vouch for their friendliness, enthusiasm, and passion for calligraphy. The meetings are informal, all levels of ability are catered for, and everyone is made welcome (the one and only condition of being granted membership is that you love calligraphy). You can find out more about Glasgow Scribes on their website. To obtain a copy of the current events programme, or to get more information about the group, please email the Membership Coordinator at glasgowscribes@yahoo.co.uk, or telephone 07538-823723. Then you can arrange to drop into one of their meetings for an informal chat. You might even be offered a cup of tea and a chocolate biscuit while you get involved in all things calligraphic. Sounds like heaven to me. I know it’s only the middle of August but, already, the evenings are getting darker and there’s definitely a wee nip in the air. Every morning, my wife insists that she can smell the approach of autumn, but I haven’t given up on summer just yet. I’m keeping the barbecue on standby just in case the sun intends one final fling. But, as my wife’s nostrils have testified, there’s no denying that autumn is just around the corner, and that means my calligraphy classes will be starting soon. So, if you live within travelling distance of Glasgow, and have always wanted to learn “the art of beautiful writing,” don’t put it off any longer. My classes are offered in Glasgow Metropolitan College (0141 566 6222), and in Strathclyde University (0141 548 4803). Both venues are within Glasgow City Centre and are easy to access. Enrol now and, with a little effort, your writing will be read with pleasure! Anyone who’d prefer to teach themself calligraphy from books, please consider the likely pitfalls described in my earlier post, learning calligraphy: my experience. Below is the schedule for the 2013-2014 term. More information about the classes is available on my website. As of 27 August, I have been advised that the classes highlighted in red, below, are fully booked. However, Strathclyde University are now accepting names with a view to starting an additional morning class in October. If you are interested in putting your name on the waiting list, please give the University a call asap on 0141 548 4803. 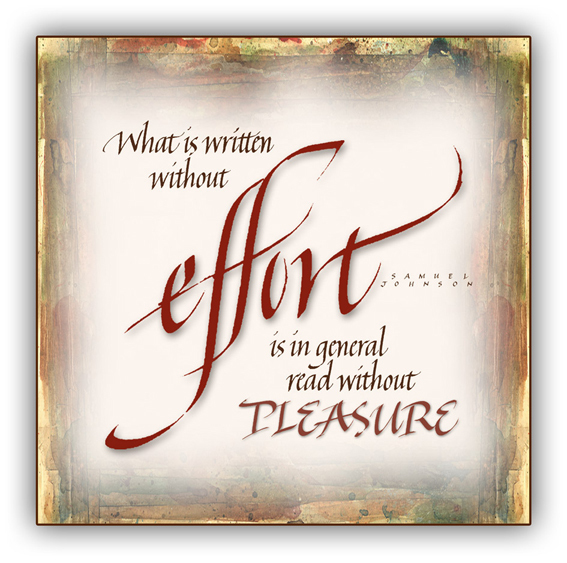 The image containing the Samuel Johnson quote at the top of this post, plus more examples of my calligraphic artwork, can be viewed on Flickr. 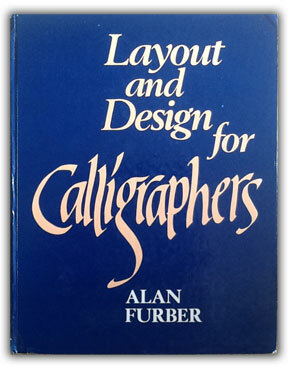 Last week I was browsing through my books at home, deciding which to choose for the class, when I rediscovered my absolute favourite calligraphy book of all time, Alan Furber’s Layout and Design for Calligraphers (see cover above). Of all the calligraphy books I own, Layout and Design for Calligraphers taught me the most about applied calligraphy. As Alan Furber describes in the book’s preface, “The emphasis in this book is on layout, not letters.” I found it indispensable in teaching me how simple (not necessarily easy) the process is of arranging letters into visually harmonious relationships. Suddenly, I became aware of balance, contrast, dominance, and the importance of white space… design elements that had never occurred to me during my initial study of calligraphy. For years, the book sat right next to my drawing board, convenient and easy to access. I referred to it on a daily basis, keen to integrate its instructions into every piece of calligraphy that I created. And it worked. Based on how beneficial the book has been to my progress as a calligrapher, I believe that everyone who has an interest in calligraphy, whether beginner or more experienced, would benefit from owning a copy of Furber’s book. It is a slim volume, at only 64 pages, but every single (completely hand-lettered) page is designed to be a perfect example of how balance and white space are essential to the creation of eye-catching calligraphic compositions. And, although the book is aimed primarily at students of calligraphy, its graphic approach would prove equally useful to students of more general design. While writing this post, I checked Amazon Marketplace in UK and found three copies of the book available for just 1p (plus £2.80 p&p). This is the bargain of a lifetime, and three people are going to get very lucky indeed if they move quickly enough. 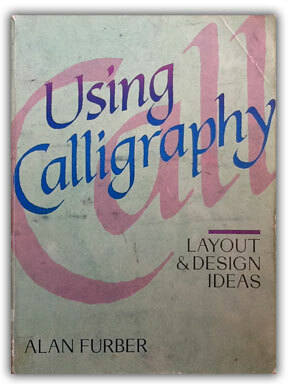 I also own Furber’s only other book, Using Calligraphy: Layout and Design Ideas. Although that volume is full of excellent ideas on how to improve calligraphic design, and is definitely worth seeking out, it doesn’t hold as special a place in my heart as its predecessor. I hope I have turned a few incipient scribes onto Alan Furber’s two wonderful books. In my opinion, he is an unsung hero of calligraphy, and I cannot recommend his books highly enough. One final tip… anyone who regularly purchases books from the main online suppliers, such as Amazon or The Book Depository, assuming them to be the cheapest, should instead try Book Butler (bookbutler.co.uk in UK, but there are international variations). For any given book, Book Butler shows the availability from every possible supplier in a list with the least expensive at the top. This is definitely my search engine of choice when seeking out books online. Hopefully others will find it useful too. I am the World’s Best Teacher. No… really… I am. And before anyone feels compelled to dispute this fact, the mug in the above photo belongs to me and is irrefutable proof of my newfound top-dog status. The mug was gifted to me by Rita, one of my students, on the final evening of my most recent calligraphy class. I was delighted to receive the recognition. I was also relieved, because now I can stop worrying about how I rank as a teacher on a global scale. I brought home the mug and proudly showed it to my wife. I thought she might be inspired to rush out and buy me a “World’s Best Husband” mug but, at the time of writing, nothing has transpired on that front. That’s OK. 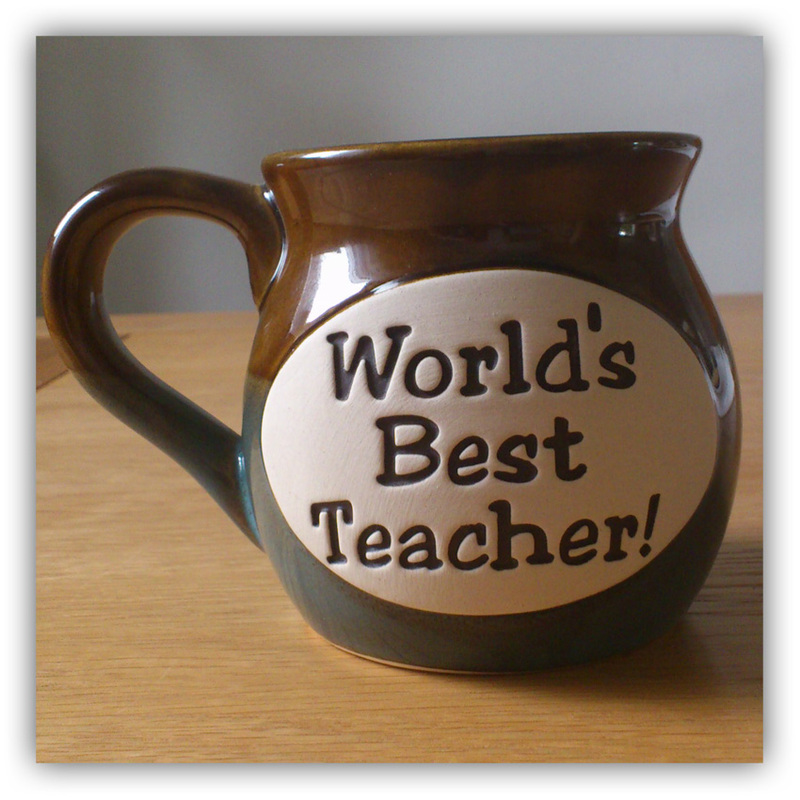 I can’t expect to be the “World’s Best Teacher” and the “World’s Best Husband” simultaneously. Something had to give. So for now I’ll wallow awhile in simply being the “World’s Best Teacher.” That’s a very nice thing to be. 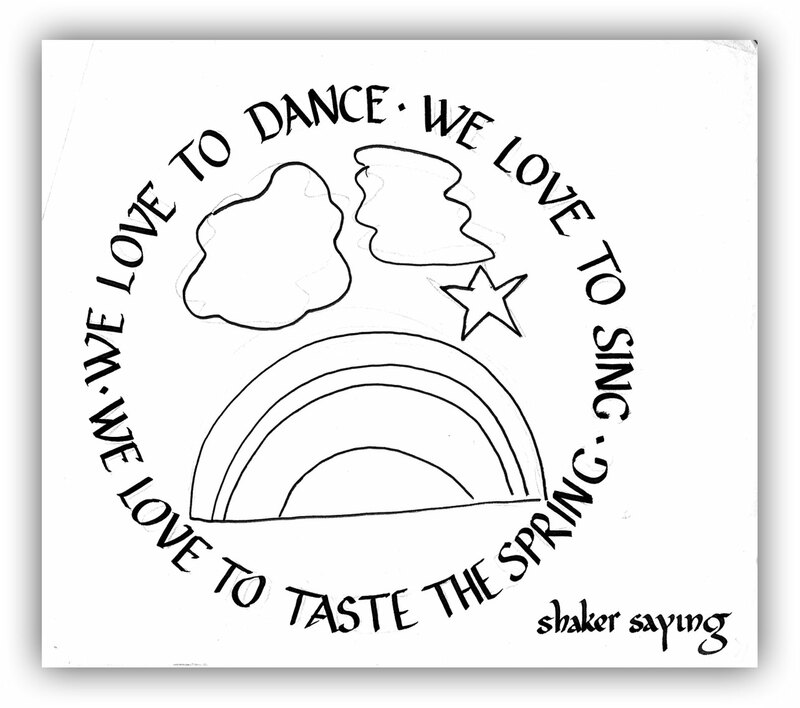 And thank you, Rita, for bestowing the title upon me… you made my day! I’ve always wanted to create artwork featuring the above quotation by Alexander Pope, so my post below about learning calligraphy presented me with the perfect opportunity. The words in the quotation are the first two lines of Pope’s “An Essay On Criticism,” but although he intended the word “writing” to be regarded in a journalistic context, I think the sentiments of the quotation relate just as well to “writing” calligraphically. They also relate well to the benefits of putting the time into learning calligraphy properly. See a larger version of the artwork on Flickr. I learned calligraphy the hard way, by teaching myself, and I would definitely discourage anyone who considers doing the same. There is only one way to learn calligraphy, and that is to attend a calligraphy class. One of the first things I tell students who attend my own classes is that they have done themselves a favour by signing up for formal tuition. Yes, it costs more than learning from a book, but it also saves an unbelievable amount of time and frustration. I don’t exaggerate when I say that, in the space of just ten two-hour classes, I teach my students more about calligraphy than I learned in years of slavishly copying examples from books. An example of my earliest calligraphy. I’m not sure what style I was intending here, but don’t laugh… we all have to start somewhere! Just to be clear, I love calligraphy books… I have a bookcase full of them… but they are no substitute for formal tuition. Books are handy for reference, for guidance, and for inspiration. But in regard to tuition, they can only illustrate a process. Unlike a tutor, they can’t demonstrate or elaborate, they can’t answer questions, they can’t nip bad habits in the bud, and they can’t motivate you when you feel like throwing your pens in the bin and taking up crochet instead. If you want to learn calligraphy, by all means surround yourself with books. But use them in support of formal tuition, not in place of it. It’s the only way. Another early attempt of mine. My first attempts at Italic produced jagged, sharp-cornered, triangular letters that resembled a succession of lightning streaks. My pen was not so much dancing across the page as zig-zagging. But, oblivious to my calligraphic shortcomings, I continued to practice my jagged triangles. Then I practiced them some more. 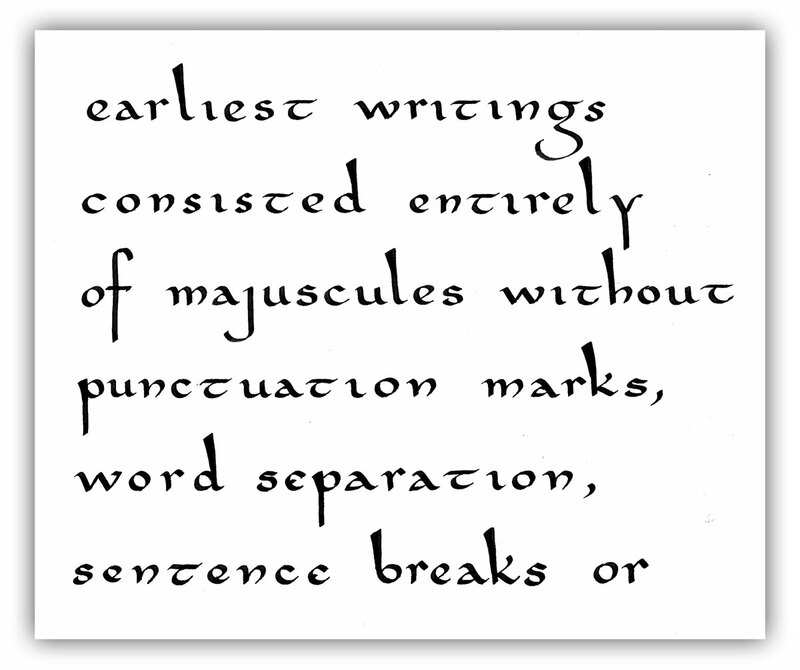 In fact, I practiced them until I became very good at being very bad at Italic. Then, with the realisation that I wasn’t making progress, I practiced some more. But despite all this practice, I just became better and better at being bad, and my latent talent for calligraphy remained stubbornly dormant. My big break came in 1987, when I saw an ad for a two week course in calligraphy and handwriting being held in Stirling University, less than twenty miles from my home. The tutor was none other than Tom Gourdie MBE, although his name meant nothing to me at the time. This was the only calligraphy class I had ever seen advertised, and I remember it being very expensive in relation to my income at the time. But I knew that it might be my one and only opportunity to gain some formal tuition in calligraphy, so I signed up immediately. Those two weeks of tuition genuinely changed my life. Thanks to Mr Gourdie’s expert tuition, whatever raw talent I possessed when I first walked through the doors of his classroom became fine-tuned within a very short period of time. He sat with each of the students in turn, giving us a few precious minutes of one-to-one tuition. I can’t explain just how much that experience helped me to progress. Suddenly, like a switch going on inside my head, everything made sense. I can only describe it as an epiphany. Consequently, I was able to undo most of the bad habits that had thwarted my progress, and that had made my lettering look distinctly amateurish. But I benefitted mostly from watching an expert create the strokes right there in front of me. It made me realise that there was no magic or special equipment involved. Mr Gourdie was writing on my paper. Using my pen. For the first time I felt confident, and thought, I can do this. It was a welcome breakthrough after the futility of following instructions in books throughout the previous two years. Copied directly from a book, if I remember correctly. My subsequent progress was so rapid that within a year of attending Mr Gourdie’s class, I began teaching evening classes in calligraphy at Glasgow College of Food Technology. Two decades later, I continue to teach in The City of Glasgow College and in Strathclyde University, and I love to share my knowledge of, and my passion for, calligraphy with incipient scribes. Having learned so much from Mr Gourdie’s teaching methods, I spend as much time as I can giving one-to-one tuition to each of my students. It’s amazing how quickly they master a stroke or letter after being shown, first-hand, how to create it. On their paper. Using their pen. And it gives me great pleasure to be able to flick the switch inside their heads, as Mr Gourdie did for me all those years ago. 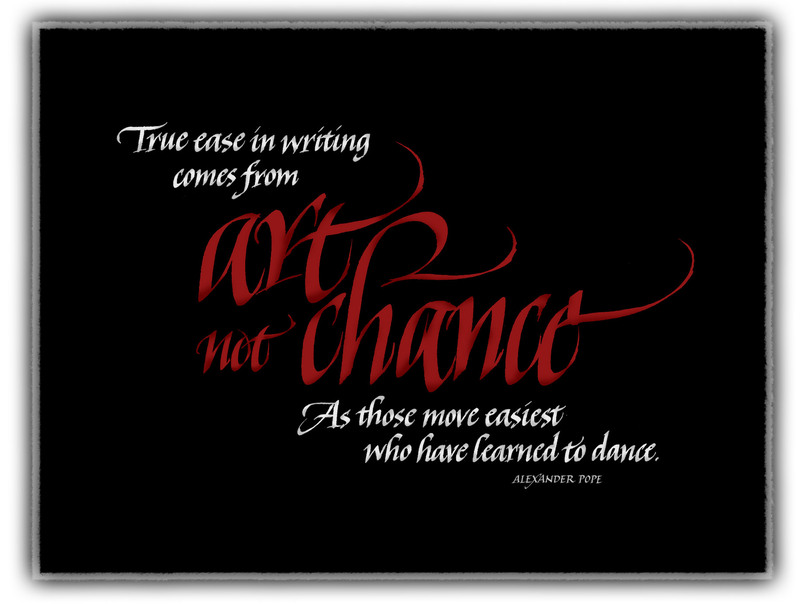 Since the late-eighties, calligraphy has been my life. I work as a freelance calligrapher during the day, and I teach calligraphy classes in the evening (even my hobby is digital calligraphy, but I tend to keep that quiet lest I become regarded as an anorak). I am convinced that if I had continued trying to teach myself calligraphy, then I would have soon given up through frustration and lack of progress. It was inevitable. And I dread to imagine how less satisfying my life would be if it didn’t revolve around calligraphy. Hopefully, I have made a good case for choosing to learn calligraphy in a classroom setting, rather than going down the self-taught route. But a number of years ago one of my calligraphy students recognised an additional benefit of attending a class that I hadn’t considered. It was the first night of a new term, and the students were putting pen to paper for the first time. Looking around the room, I noticed one young chap who appeared to be distracted and perplexed. I assumed that he was having difficulty with his letter-making, so I caught his attention. “Do you have a problem?” I asked. Not the type of problem I felt qualified to deal with, so I resisted the temptation to become their go-between. I don’t know if he ever did get her number, but the combination of romance and calligraphy would surely have led to beautifully written wedding invitations. And I don’t know of anyone who ever got a date while learning calligraphy at home, on their own! If you would like to comment on your experiences – good or bad – of being a self-taught calligrapher, I’d love to hear from you. Sometimes unexpected things happen that simply knock you for six, and a few days ago such a thing happened to me. But before I explain, I’ll set the scene. Back in 1985, when I first decided to learn calligraphy, there were no classes available, so I decided that I would teach myself from a book. It can’t be that difficult, I thought, having no idea what I was letting myself in for. After buying a calligraphy pen, I went along to my local library and was directed to the “calligraphy section,” which consisted of a single book: Margaret Shepherd’s Learning Calligraphy. I duly booked it out and, with no consideration for anyone else who was thinking of learning calligraphy courtesy of the local library, I selfishly borrowed the book continuously for the next two years. Learning Calligraphy became my constant companion. Almost every day I practiced from its progressively dog-eared and ink-stained pages. I eventually returned it to the library and purchased my own copy, which is still in my possession (and which I, naturally, have kept pristine and ink-free as the photo above confirms). I later created an arsenal of Margaret Shepherd books by purchasing, Capitals for Calligraphy, Borders for Calligraphy, and Calligraphy Projects for Pleasure and Profit, all of which played a huge part in my introduction to the craft. Calligraphy Projects, in particular, gave me my first ideas about how to use my hand-lettering constructively. Unfortunately, I didn’t use the books efficiently. I was impatient, in a rush to master the alphabets, so I copied the letters without paying much attention to the instructions. Consequently, through no fault of Ms Shepherd, my progress was slow. I eventually attended a short, but life-changing, calligraphy course (more of which in my next post), which assisted me enormously, and helped me to get more from the books that I owned. Despite my self-inflicted slow progress while learning from her books, I can wholeheartedly attribute everything I learned during those first two years to Margaret Shepherd. Even now, twenty-seven years after discovering Learning Calligraphy in the library, I show examples of her work to my calligraphy students, citing her as my original influence. Throughout almost three decades as a practicing calligrapher, I have considered her to be the person who kick-started my career in hand-lettering. A few days ago, this very blog received an emailed comment that was complimentary about a post that I had written. Although I was delighted with the positive feedback, I was distracted by the name of the person who had commented. It was familiar, making alarm bells ring in my head. Margaret Shepherd must be a pretty common name, I thought, not daring to get too excited. I clicked on the associated website address and… sure enough… it was THAT Margaret Shepherd. It was a surreal moment, and I was absolutely gobsmacked. I spent the rest of the day excitedly babbling to everyone I met that Margaret Shepherd had contacted me. My wife and son were delighted, of course, but random strangers seemed wary of my enthusiasm. I think they must have been feigning disinterest, because how could anyone fail to be moved by the fact that Margaret Shepherd had written to me? I immediately wrote back to her, describing the impact that her books had on me while I was learning calligraphy. Embarrassingly, I probably gushed like a starstruck teenager, but she was kind enough to respond, and mentioned that she had looked at some of my work online. “Very nice Italic,” she wrote. I’m back on solid ground now, but the kind words of Margaret Shepherd will keep me buoyant for weeks to come. Margaret Shepherd is presently working on a book about American Calligraphy. Many of her calligraphy books can be purchased on Amazon here. In my role as calligraphy tutor, I frequently teach left-handed students. I am presently teaching two classes, and out of twenty-six students three are left-handed (normal ratio of left-handers to right-handers is around 10%, so 3 out of 26 is about right). Having learned calligraphy the hard way, being almost completely self-taught, I would recommend that anyone (right and left-handers) who wants to learn the craft should attend an evening class. Books can tell you what to do, but there is no substitute for having a competent tutor demonstrate the numerous pen-strokes, and who can elaborate on calligraphic techniques and the characteristics of various alphabets. I’m right-handed, so not being ambidextrous, it’s more difficult for me to teach calligraphy to a left-hander. Because of this I have found the book Left-handed Calligraphy by Vance Studley to be very useful… both to me and to my left-handed students… and I would definitely recommend it as an essential resource. I totally disagree with this review. Contrary to the reviewer’s comments, there is no such thing as a dedicated “left-handed script style,” just as there are no dedicated right-handed script styles. That’s why the reviewer couldn’t find any such scripts in this book. ALL calligraphic alphabets can be learned by both right and left-handers. It’s just a bit more difficult for a left-hander to achieve success. Although it’s no substitute for formal tuition, a book such as Left-handed Calligraphy will explain essential information such as how a left-hander should write with an oblique nib, and with their paper sloping. Calligraphy takes time to learn, and demands determination, patience and a lot of practice whether by a left or a right-hander. Success is not achieved overnight. My single reservation about the book is that it is a wee bit old-fashioned in its presentation (the newest edition was published almost 20 years ago) but in a world dominated by right-handers, left-handed calligraphy books are thin on the ground. Therefore I would definitely recommend that left-handed incipient scribes grab a copy of this book while they can. Buy a new copy of Left-handed Calligraphy on Amazon from just two pence + £2.80 p&p (at time of writing). Or read the first eleven pages on Google Books here before you buy. There is a new source of information for left -handed calligraphers at Bill’s Space. In Bill’s words, “Here I have begun a collection of links, videos and articles of interest to the left-hander, hoping it will make life easier if they can find hints, tips and encouragement all in one place.” Definitely worth a visit. For a list of left-handed calligraphy books and pens, visit Anythingleft-handed.co.uk. Read the musings of a left-handed calligraphy student here. Discover the many ways to write left-handed here. Watch an interesting YouTube video called Writing Left-handed here. And finally, anyone who thinks that calligraphy can’t be mastered by a left-hander should look at Gaynor Goffe’s work here. Simply amazing! I find it hard to believe that I’ve been teaching calligraphy for over twenty years. I can certainly vouch for the fact that time flies when you’re having fun. At present, my classes are offered in Glasgow Metropolitan College (0141 566 6222), and in Strathclyde University (0141 548 4803), both venues within Glasgow City Centre that are easy to access. If you live within travelling distance of Glasgow, and have always wanted to learn “the art of beautiful writing,” don’t put it off any longer. Enrol now, and you’ll wonder how you ever got by without having calligraphy in your life! Here is the schedule for the new term. Wednesday evenings at 18.00 – 20.00 for 8 meetings from 20 April 2011. PLACES AVAILABLE.